▶ Lemon Bars – Easy Lemon Meringue Bars Recipe – YouTube. Garnish with powdered sugar; or top with meringue (the extra egg white whipped with 1 tablespoon of sugar) and brown with torch. ▶ Apple Hand Pies – Apple Turnovers Recipe – How to Make Hand Pies – YouTube. ▶ DIY: How to Make Popcorn Cake! – YouTube. ▶ Very Simple No-Cook Lemon Cheesecake Recipe – YouTube. You can use Saint Moret instead of Philadelphia Cheese, and Roudor instead of Graham Crackers. ▶ Valentine’s Day Red Velvet Cake Recipe – YouTube. ▶ Cinnamon Rolls Recipe – YouTube. ▶ How to Make Thanksgiving Dinner – YouTube. ▶ Caramel Shortbread (Millionaire’s Shortbread) Recipe – YouTube. How to Make Chocolate-Covered Strawberries | Candy Making – YouTube. You melt the dark chocolate at low temperature. You use melted white chocolate to drizzle over the dark chocolate. Layer blueberries, low-fat vanilla yogurt, and strawberries in a tall glass and serve cold. 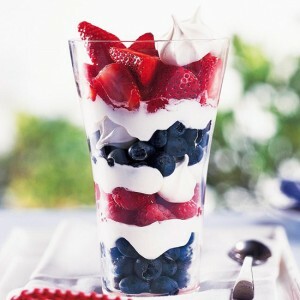 July 4th Trifles – YouTube. In France you can’t buy Angel Food Cake. Use any ordinary cake (cut in small pieces) instead!